We've all heard the phrase: A Dog is Man's Best Friend. And be it ever so true, just how did that phrase come about? "The one absolutely unselfish friend that a man can have in this selfish world.......... is his dog." 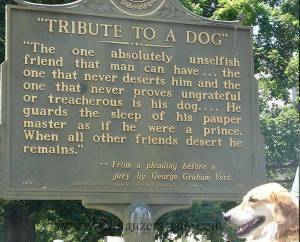 Many believe the phrase a Man's Best Friend, originated from Senator George Graham Vest of Missouri, during a closing argument he presented to a jury back in 1870. His client, was a grief-stricken man who was suing his neighbor for damages in the maximum amount allowed at the time of $50, for having shot and killed his beloved hunting dog, Old Drum, the previous year. Not only did Senator Vest win the case for his client, there wasn't a dry eye in the courtroom after his closing argument. 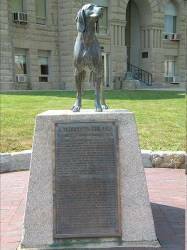 To this day, a statue of the foxhound Old Drum remains standing in front of the Warrensburg, Missouri courthouse. Senator Vest Gentlemen of the jury: The best friend a man has in this world may turn against him and become his enemy. His son or daughter that he has reared with loving care may prove ungrateful. Those who are nearest and dearest to us, those whom we trust with our happiness and our good name, may become traitors to their faith. The money that a man has, he may lose. It flies away from him, perhaps when he needs it the most. A man’s reputation may be sacrificed in a moment of ill-considered action. The people who are prone to fall on their knees to do us honor when success is with us may be the first to throw the stone of malice when failure settles its cloud upon our heads. The one absolutely unselfish friend that a man can have in this selfish world, the one that never deserts him and the one that never proves ungrateful or treacherous is his dog. Dogs touch our lives in so many different ways. And I think it can be firmly stated that a dog truly is every man (woman & child's) best friend. If your Miniature Schnauzer, that meant the world to you, has crossed over Rainbow Bridge create a free Miniature Schnauzer Tribute in their honor and let it be known that although he may be gone..... he will never forgotten. My Dog, My Schnauzer, My Best Friend! We could learn a lot from our dogs. Be sure and check out Life Lessons from a Dog. It may just make you think about things a little differently. Enjoy the video with Schnauzer pics as Nellie McKay sings "The Dog Song"
If you enjoyed reading this article, please be sure to share it with your dog-loving friends and family by clicking on one of the share links at the top right or bottom of this page (like facebook or twitter). Thank You!